It may be premature to say “Spring has sprung” but I bet we can agree we’re ready to put away our sweaters, wool dress pants, and coats to make room for a spring wardrobe. Whether pulling favourite pieces from previous years, keeping our eyes out for new pieces, or if we’re just plain in need of a spring wardrobe, it feels good to know the days are getting longer. And, if you’re like me, you share the excitement in uncovering sale pieces purchased at the end of last year…that you forgot you had! BONUS! Season by season, one constant and an absolute staple (besides blue jeans) for me is a blazer. It’s a classic all season/occasion/weather item, and the perfect travel companion. It’s the “polish” piece that brings a business feel to casual looks, and is a perfect complement to blue jeans, dress pants, shorts, skirts, a dress and even a pair of tights or sweats – I’ve done them all. A blazer is also a great replacement for a jacket on cool mornings or evenings; just wrap a scarf around you and you are set to go! I have worn blazers with a boot, pump, flat and sneaker. This week, I had the opportunity to connect with the team from the Canadian brand, SMYTHE, whose story all began with the blazer. 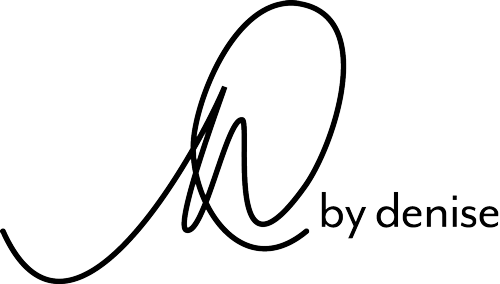 It’s a Canadian owned and women-led company, with most of its operation occurring in Canada and the design centered out of Toronto. I love my SMYTHE blazers for the quality, cut, and feel. While they are investment pieces, they are so versatile as well as classic. SMYTH blazers came to life through the vision of its Co-Designers, Andrea Lenczner and Christie Smythe (pictured below). This week, we learn more about the importance of staple pieces, why versatility is key to long lasting blazers, and how designing for the modern woman has brought success to the SMYTHE brand. How did SMYTHE come to life? We met in high school and went to University together in Montreal. We dreamed of working together in design but didn’t quite know how. In 2003 we were back in Toronto, and had a 10-minute call that ended up being the foundation for our business. We knew were going to design blazers that we wanted but could never find. At the time, the premium denim craze was at its height but there were no great standalone blazer options. There was no womenswear equivalent to a men’s sport jacket – for women, you had to break up a two-piece suit. So, we identified a gap in the market and decided to focus on one category and master it. That’s how SMYTHE started in 2004. What’s your favourite memory building SMYTHE? We love to reminisce about the foibles and hardships… meeting unique characters in our industry and how uninformed we were. For years, we worked from Christie’s house in a mouse space. Christie didn’t have a phone or car. We packed, we shipped, we cold-called, we quality checked, travelled with carnets (anyone in the business will sympathize), stood at trade shows, fumbled through accounting and pricing. Any success in those early stages was incredibly rewarding. Why is a blazer such a “must” for travel? There’s a transformative quality to a blazer. You can be in the most casual outfit, but if you put on an amazing jacket overtop suddenly you feel put together. Which style of blazer do you recommend for the modern middle-aged professional woman? Specifically, one that takes her from day to evening, whether dinner or travel? For daytime options, consider the corporate culture of your workplace. Conservative environments tend to favour darker, more traditional pieces but then again, maybe you can stand out in a bold coloured topper. Taking a jacket from daytime to dinner is all about accessorizing: anything can work with the right accessories. When travelling, consider something you’ll be comfortable in, that doesn’t wrinkle easily, and suits the climate of your destination. If you had to pick just one blazer, what style and colour should every woman have? It’s a matter of personal preference, really. Obviously, it needs to be a style that’s flattering to your body type, fits with your lifestyle, and makes you feel confident and look great. But other than that – go with whatever speaks to you! 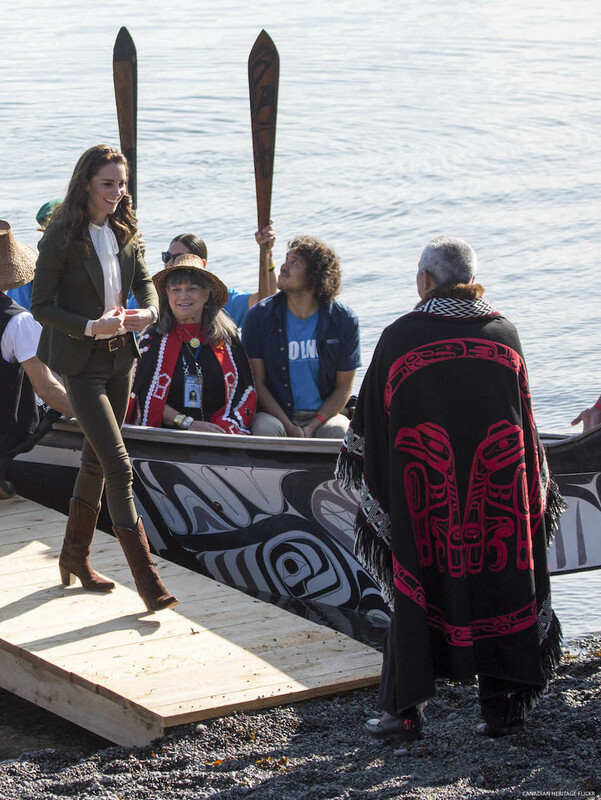 How did it feel when Kate Middleton wore a SMYTHE blazer on her first official visit to Canada in 2011? When we first heard The Duchess had chosen a SMYTHE piece for her Canadian tour, we were absolutely thrilled and perhaps a little naïve about the impact it would have. It is very meaningful that over the past seven years, The Duchess continues to wear this blazer, validating our intention to create timeless investment pieces. Meghan Markle is also a fan of the brand, and was seen wearing a SMYTHE coat recently in London. Yes, it’s great to see how a coat can be worn several ways. Meghan first wore the Brando Coat casually with a ball cap and jeans in Toronto in 2016. And then recently in London, on official duty, the coat was part of more tailored and polished look. In a world of disposable clothing, both Royal (or soon-to-be!) figures are sending a message of conscious consumption. Today, SMYTHE is more than blazers and jackets. When and how did this happen? Our goal was always to design from a lifestyle perspective. And since you can’t build a wardrobe on jackets alone, we decided to expand into other product categories. We wanted to flex our creative muscle and build a collection that we would want in our own lives and closets. Now, SMYTHE is a full ready-to-wear collection that includes suiting, blouses, item skirts, pants, dresses, knits and outerwear. What are you proudest of when you think of SMYTHE? We are most proud when we spot a woman on the street wearing SMYTHE. In a crowded marketplace where we have lots of choice, that is the most rewarding feeling. It’s exciting to think through spring style. As middle-aged women, we can explore timeless style with new accessories, and consider an investment piece that fits with our lifestyle, makes us feel confident and look great. 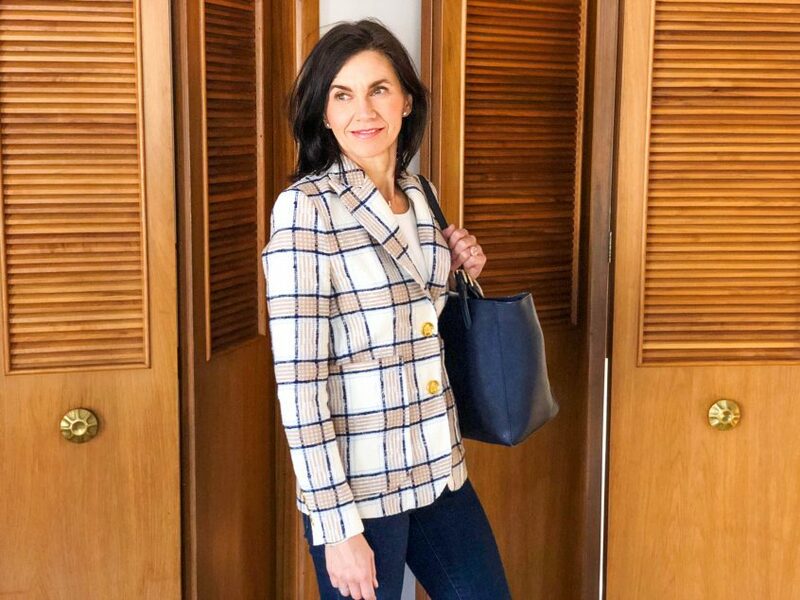 We may not require a full suit each day, but a classic blazer certainly lends a fresh yet timeless look at modern daily wear: it is truly a woman’s best friend (next to a bright new spring lipstick of course)! Break out your spring style and try the classic blazer look, and support a local designer in your community while you’re at it. Why? Because we’re modern middle-aged women, and we deserve to spoil ourselves every now and then!